Optimal healthcare solutions now at the convenience of your own home. At Trustmedi you can avail medical assistance, nursing staff, doctor visits, physiotherapists as well as medical or surgical equipment solutions at your residence. Search among our numerous promising and trustworthy Healthcare at Home Providers. Review and select the most appropriate Provider for you. Book & Schedule Appointment. Choose a favorable payment mode. Relax & Avail Healthcare services at your residence at the stipulated date & time. Share your valued feedback & Recommend to your kith and kin. This is to inform you that I have taken services from your organization from PRITY for lineup of Doctors. First service was for myself for ENT, I got very good support from PRITY. I was very much satisfied. That’s why I took 2nd service for my family for Dental Dr . Very good team support I got. Very thankful to trust medi for their cooperative behaviour and guidance. Because of you I am able to take appointment of Dr. Sudip Bhattacharya. I would like to say that this type of healthcare support service should always be there with everyone.Thank you Dr Dipankar Sarkar who guided me for the furthur treatments to be done and would like to thanks Prity for her sincere effort in arranging appointment. I am satisfied with your (Trustmedi.com) service. We could get the doctor's (Dr.Indranil Saha- Neuro Psychiatrist) appointment and contact details. I sincerely appreciate the time you spent reviewing and recommending strategies for contact the famous Doctors. Specially Sm Priti Basu Mallick a very helpful and gave me a new perspective on available opportunities. I specially appreciate Sm Priti Basu Mallick offer to connect me in her Network. I plan on following up with the contents the right away. I will also use the online networking resources your organization(Trustmedi.com) recommended to everyone. Again, thank your organization(Trustmedi.com) help. I would like to thank you for your help to fix an appointment with Prof Pahari Ghosh. My sincere thanks to Mr. Shubhajit, for his extended support and Trustmedi.com service. This is with regard to the service I received from trustmedi. I am really impressed by the service that I’ve received. The representatives of the company are really well interactive and are very polite in nature. They understand the sensibility of the customer and thus provide help with immense care. I will suggest this site to all those who are seeking help in the field of hospitals and doctors. It was a really new and pleasurable experience which I had from your side. I was on a search of a good Psychiatrist in the town and no wonder Trustmedi has fulfilled my search. I got a very good Psychiatrist, Dr. Bhaskar Mukherjee at ILS Hospital,Dum Dum after my visit. Your executive Prity was wonderful, she has helped me from searching a good doctor, till fixing my appointment with him and also updated me with all the status. She even alarmed me of my appointment and also took the feedback. I was rather I am really happy with the service of Trustmedi and I believe it’s a great work done from your end which will really help especially the old people and also it’s a great assistance for everyone to find a good doctor near them. Therefore I appreciate Trustmedi to carry on the good work and all the very best for your future. There is nothing to say about your co-operation, service and behavior. I am thankful to you for giving your helping hand. I was searching for a General Physician on Google and I have been redirected to trustmedi site. I called there and a doctor appointment has been fixed by a customer care executive. The behavior of the customer care was very familiar. The appointment booking was very hassle free. And moreover the appointment was done by the customer care itself. After that they have been contacting regularly, asking if you are having any problem reaching to doctor's address. Even the customer care has called after meeting the doctor, asking about whether the doctor has consulted u well or not. It was a wow experience!! Thanks a lot to trustmedi customer care team. 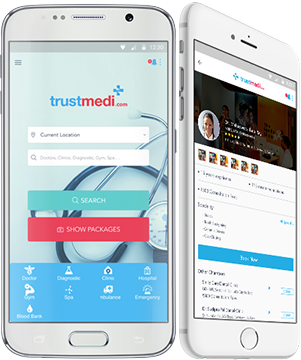 Trustmedi is doing excellent work by serving people who are in need and are clueless about medical services in unknown cities or even in their native cities like friend, guide and well-wisher. Customer service Persons like Prity Basu are it's backbones who are extremely dedicated to serve the needful. I would like to say a big thanks to her. My sister fell suddenly ill when visiting Kolkata. Suspecting cardiac issue, I searched for a Cardiologist on trustmedi.com. To my amazement, I instantly found a cardiologist who visited home, ECG was done at home and medicine was administered. My sister got well soon.Thanks, Trustmedi.com. Manage your appointments with One Touch. Quick and easy booking, schedule an appointment, save lives, and your precious time. Setup your profile at an ease and manage your own secured dashboard as per your choice. “Go Green”, store your medical reports digitally on cloud and get the required ones instantly, anytime from anywhere.